A police dog involved in a crash in Aberdeenshire which left his handler seriously injured has been put down. The crash happened on the A90 Aberdeen to Peterhead road at Auchiries, Longhaven, near Peterhead last Tuesday. The 46-year-old officer was taken to hospital. His condition on Monday was described as "stable". 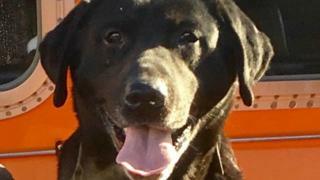 Police Scotland said Sam, a "much-loved" nine-year-old black Labrador, was put down following complications after surgery.